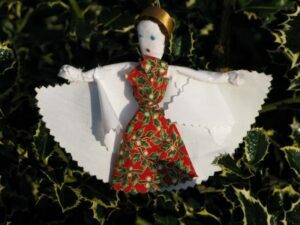 Welcome to this week “Fabric Scarp Angel” a lovely Christmas Ornament… now I love love love this little angel ornament for several reasons: Firstly.. it is recycled. 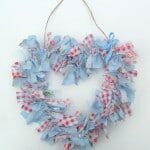 You know me and recycling, there are so many “bits and pieces around the home” that really can be put to good use and it is great when you make something cute and pretty out what is deemed rubbish. Secondly.. this post was sent in by a reader! 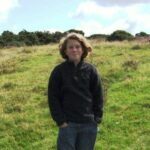 Yes, that is right, a friend’s friend is a crafty old so and so and asked if she could do a guest post… Thirdly… the this friend, Zoe, is only 13years old! Isn’t that something? When I was that age, crafting was a big part of my life. I loved making all sorts of things, and I loved it even more when others recognised and got see it. 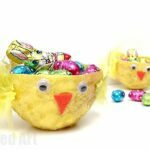 I think it is fabulous that a 13 year old, who has never written a blog post or a craft instructions before is able to come up with something this cute and share it with you. I hope you like too. Read on and be inspired. You may also like our new Christmas Ornament Book. 30 of our favourite ornaments brought together in one place. Sorted by age. Each craft is shared on one page – making the perfect worksheet print outs. Lovely to have them all in one place too! Step 1: Cut Dress: Use template aprox 15cm diameter to make a circle on the back of the “Christmas” fabric for the dress of your angel. Cut this out with pinking shears, this will prevent the fabric from fraying, and will create a decorative edge. Step 2: Arms & Hands: Cut 3cm by 7 cm rectangle from your white or skin coloured fabric again, use the pinking shears, roll up the fabric on the longest side, to create a roll of fabric about 1cm wide. Sew the long edge to stop it unrolling. Use running stitch or backstitch. Fold over the ends of the roll, sew up to make “hands”. Step 3: Head: Cut a 5cm by 5cm square from the white / skin fabric, put some stuffing / scraps into the middle, sew around a circle, pull tight to make the head ball. 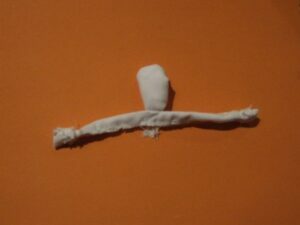 Step 4: Combine Arms & Head: Sew the head and arms together to look like the above. Step 5:Add Skirt: Cut a hole in the middle of the Christmas fabric circle just big enough to pull the head through, and two smaller holes either side to pull the arms through. It should now look like the above. Step 6: Put more scraps into the “chest” of the angel, hold in place by a waist ribbon or a small piece of the dress material. Some stitches may be necessary to stop the “chest” falling out. Putting in the waist ribbon will make the skirt of the dress, putting the gathers to the back will make a “straight” skirt, a fuller skirt can be made by putting the gathers at the front, play with it until you are happy with the shape. Step 7: Wings: Using Pinking shears cut out a yellow or white circle using the same size template as used for the dress material. Cut in half, and put around the angels arms/shoulders, sew in place from the back. The other half of the material can be cut in half again, folded in half and used to make fuller wings. Step 8: Hair: using the brown or yellow wool, cut into short lengths and sew onto the angels head. If you sew in a spiral pattern going down the sides it will look like plaits. Make the loose ends of the wool into a bun, and stitch into the back of the neck, or leave loose, but make sure it is firmly in place. Step 9: Halo: use a short length of gold ribbon to make a halo, a couple of stitches at the back of the head will hold it in place, let the front of the halo sit in place. Step 11: Hanging: Make a loop of thick cotton, or ribbon. 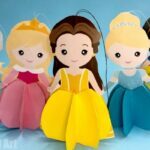 Stitch firmly into the back of the head and hang it up on your tree! Extra’s – lace at the angels wings, or around her neck, glitter on the wings. 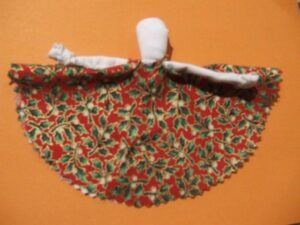 Larger versions (without wings) can be made as “rag dolls”. Now.. what do you think? Isn’t Zoe simply the craftiest teenager around? Thank you so much for sharing your little angel and rag doll idea on Red Ted Art! Gorgeous, isn’t it? So sweet! And love how it is all recycled! So pretty and this takes me right back to sewing class at prep school. Thanks! Thank you, love the little Christmas angel. We do a crafts based advent calendar at home. So every day there are the ‘ingredients’ for a craft activity in one of the pockets. 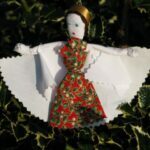 I’ve just put together an angel one from bits and pieces at home. Wow! 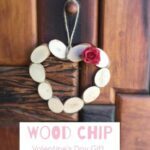 A craft a day!!! I am IMPRESSED! Goes beyond my crafting patiences ;-))))) btw have you seen this https://www.redtedart.com/2011/11/30/daily-advent-calendar-activities/ daily activity to help you along the way! This is very nice! Thanks for your detailed tutorial! Maggy, how sweet of you to feature this! Kate – she really is very creative, isn’t she! Rashmie – *beam* a crafty star is born! Absolutely gorgeous – I think I will be making some of these and even have some fabric pens so can use my white cotton and J can decorate with the fabric pens. Thanks you Zoe and brilliant instructions on how to go about it. Zoe, it’s beautiful! 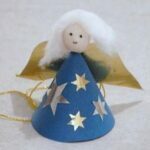 I love to have angels all over my tree, so I may have to make one of these myself! Cerys – Ooh great idea to use fabric pens! 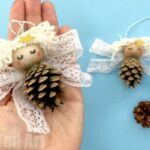 Terri – Yes, wouldn’t a tree covered in them be lovely!?! Wow this is so lovely Zoe! I’m very impressed that you did this and wrote the tutorial yourself! Time for your own crafty blog perhaps?! What a beautiful idea and great tutorial! Our girl scouts are working on a homemade Christmas for the local Christmas parade these would be perfect thanks for sharing. Anna – yes, I agree, I think she did really well writing the step by step guides with all the photos! Amber – oooh perfect for a Guide Christmas parade! Zoe, you need a blog. Great instructions and cute idea. I loved the photos too. They really helped me since I am sewing illiterate. I think my daughters would love making these. Thanks for the tutorial. I love it!! What a lovely angel! Such a simple to follow tutorial too! I think we’ll have to make an angel for our tree today, it’s exactly what our’s is missing! Thanks Zoe! What a lovely little angel, a beautiful addition to the tree! Well done! Thanks for sharing. What a beautiful little angel. I’m sure my girls would like to make one as well. It’s on my to-do list now. Thanks for the great tutorial. So adorable! I just love that angel! 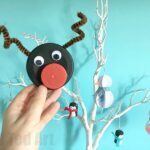 Such a cute Christmas craft! Thanks for linking up last week for Fun Stuff Fridays. I’d love you to link up with us again. Great step by step tutorial, thanks! I can’t wait to try this at home with my kids! What a gorgeous angel. I am looking forward to trying to make one. 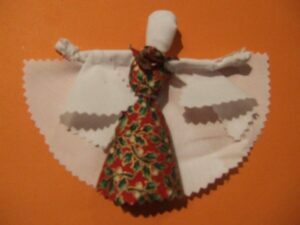 I love how this angel uses up fabric scraps too! 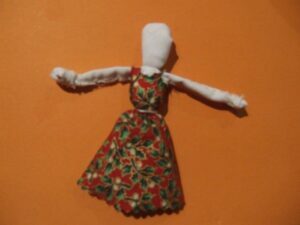 And that you can make it into a rag dolly for your child! That’s so beautiful. I love that it uses scraps if fabric. I can’t afford new decorations this year so tjis is a good one to make with my angel obsessed daughter. I love homemade decorations. I am sure whatever you make will be far prettier than shop bought items!! I don’t know if you get a chance to read this by yourself. Thank you so much for sharing your talent (cause that is what you have!!!) with us. ps: Maggy : great choice for a guest post! Great job, Zoe!! This is very cute and your tutorial is wonderful. Thank you for sharing your talent with us! I have been outdone by a 13 yr old! Bravo on the sewing of a fabulous angel and excellent directions! I might have to give this a try! Oh my goodness! What talent! The angel is beautiful and I love that young people are involved in creating and sharing their passions and ideas! Loved this post! What a clever idea!! I love this post and think the colors are beautiful. Would be great on my Christmas tree! Printed out and ready on the table for my (nearly 3 yr old)grandson to start work tomorrow morning with Mrs Jason (Nanna J). Sunday is “Get the Tree day” so perfect timing. Wow, that’s a skillful and crafty 13yr old… love it!! This is such a fun project! Thanks for sharing!! Wow! this is neat. I can’t wait to show my daughters and see if they would like to make this. Fabulous! Thank you so much for sharing, I am delighted it is linked up on Festive Friday on my blog this week! My 11 year old daughter and I are really looking forward to having a go at this..your instructions are really clear! Such a beautiful craft, thanks for sharing Zoe! 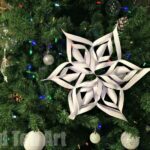 Can’t wait to have a go at making these for our tree. She’s really lovely! Thanks for sharing with us at the Play Academy. Cute scrap angel! Nice post! Thanks for sharing! Saw your linky at the Sunday Showcase, so wanted to pop by to say hello. Aah thank you and yes will come and stop by for a visit!